In an enrichment class taught by Lower School Art Specialist, Susan Fusco-Fazio, at the Shaller Campus this winter, students used yoga postures and relaxing guided meditation as a preparation for painting, drawing and collage to awaken the imaginations of their “inner artists.” Susan shares, “Students in Yoga Art spent the first half of each class on their yoga mats listening to soft music while doing yoga poses or meditation. They enjoyed stretching, bending, clearing the mind and body of stress and becoming more happy and peaceful.” The art projects each week related to themes in that week’s yoga flow. For example, doing heart opening yoga poses and creating energy paintings of hearts, or doing sun salutations yoga poses and painting abstract energy suns. 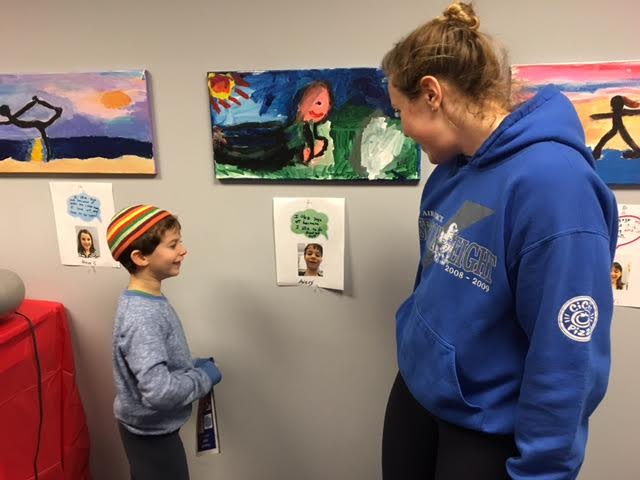 As the culmination of the class, the artwork was displayed this week in an exhibit and reception held at the Shaller Campus. Sixth Graders Score Big at the Will McDonough Sports Writing Contest!